North India with Nepal Tour, a tour package of 14 nights and 15 days will offer you a chance to explore the will-known destinations of the northern region of India along with the popular attractions of Nepal. 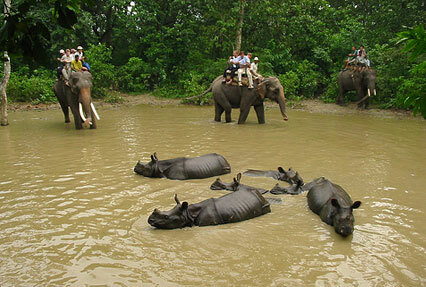 During the tour, you are going to visit places such as Delhi, Jaipur, Agra, Khajuraho and Kathmandu. This itinerary is a mix of various kinds of interesting activities such as visits to world heritage sites, a wildlife safari, a boat ride and visit to popular temples amongst other things. After arriving at the Delhi airport or railway station, you will receive an assisted transfer to your pre-booked hotel. The rest of the day is free for doing the activities of your interest. You can explore the surroundings, can shop at the famous city markets or can gorge on street food. Stay overnight. The second day of the tour is booked for covering the attractions of Delhi. After breakfast, you will visit the attractions of New Delhi including Laxmi Narayan Temple, India Gates, and Parliament House. After lunch, the day is to cover the Old Delhi attractions such as Jama Masjid, Red Fort and Gandhi memorial. The evening is for sound and light show. Stay overnight in your hotel. Today, after breakfast, you are going to begin driving towards Jaipur. Once you arrive in Jaipur, check-in at your hotel. Post lunch, you are free to spend the day as per your interest. You can explore the well-known markets to shop for some souvenirs or can enjoy eating tasty street food. Stay overnight. Enjoy sightseeing today. 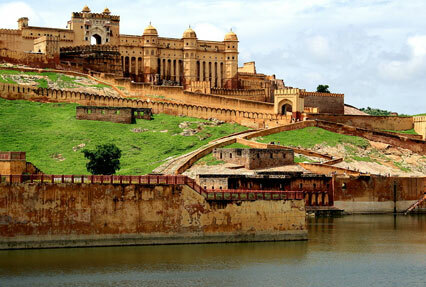 The first visit of the day will be Amber fort where you are going to enjoy an elephant ride. Once you reach this fort, situated on a hilltop, explore the structures inside it such as Ganesh pol and Sila devi temple etc. Later, post lunch, you will continue your city tour including City Palace with its splendid courtyards and gardens, the Royal Observatory and Nawab Sahab Ki Haveli. Visit the local bazaar to shop for handicrafts, jewels, imitation jewelry etc. Stay overnight. Today, after an early morning breakfast, you are going to begin your road journey to Agra. 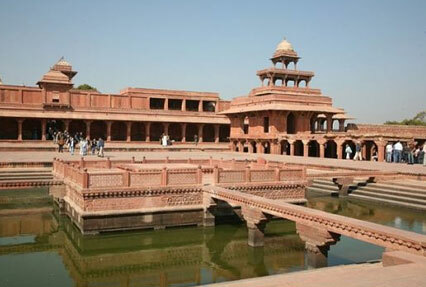 On the way, you will stop at the old deserted town of Fatehpur Sikri, erected by Mughal emperor Akbar. Once you reach Agra, check- in at your hotel. Later, move out of your room for sightseeing where you will visit the Taj Mahal- a white- marble mausoleum commissioned by Shah Jahan for his wife Mumtaz Mahal. The last visit of the day will be Red Fort – also known as Agra fort that is a Mughal architectural beauty. Stay overnight. On the 6th day of your tour, you will go to the railway station to board a train to Jhansi. As you reach Jhansi, you are going to get transported to Khajuraho by road. On the way, you are going to stop at Orchha. Explore the attractions of this quaint town of Madhya Pradesh that may include Chattris, Jahangir Mahal, Phool Bagh and more. Continue to Khajuraho later on. Upon arriving, check into your hotel for staying overnight. Today you are going to have an early morning breakfast and then leave for exploring the World heritage site of Khajuraho temple, which will include the Eastern and Western group of temples that will comprise of Laxmi and Varha temples, Devi Jagdamba, Kandariya Mahadev temples amongst others. After lunch, you will be transferred to the airport for boarding a flight to Varanasi. Once you reach, check-into your hotel. If time and energy permit, you can explore the surroundings on foot. Stay overnight. Day 8 is booked for exploring Varanasi which is going to include its prime attraction- several bathing ghats in a row. In the wee hours of the morning, enjoy an early morning boat ride in the holy water of river Ganga. Back to hotel for breakfast, post which you are going to visit the ghats and the popular temples like Tulsi Manas temple, Bharat Mata temple, Alamgir temple etc. Have your lunch and leave for an important Buddhist religious site- Sarnath. Stay overnight. 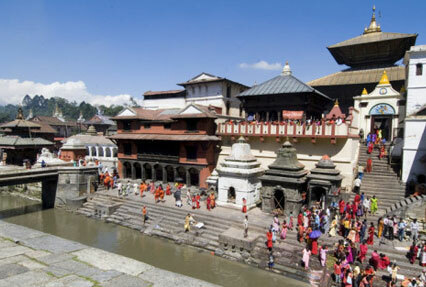 Move to theairport today and board aflight to go to Kathmandu, the capital city of Nepal. Once you will set your foot at the Tribhuwan International Airport, you will meet the IHPL representative who will help you with transfer to Chitwan by road. On arriving, check- in at your resort. The day is free for leisure activities. You can now explore the untouched beauty of this charming place. Overnight in hotel. On day 10, you are going to explore the exquisite wildlife at Chitwan national park, the first national park of the country that is now a world heritage site. The day is free for various activities- you can indulge in a nature walk, bird watching, enjoying an elephant back Safari. The evening is booked for a traditional Tharu cultural performance. Overnight in the hotel. Today, you are going to begin your road journey towards Pokhara. Once you reach, complete the check- in at your pre-booked hotel. Freshen-up and have lunch. After lunch, treat your eyes to the surrounding beauty. Take a leisure walk around the nearby lake side or you can also try boating. Stay overnight. Day 12 will start with an early morning (one hour) boat ride at very beautiful Phewa Lake covered by forests and mountain peaks. Later, visit the temple located in the center of the lake. Have your breakfast and leave for a trip to Sarangkot. This is a beautiful village where you can have a mesmerizing view of the Annapurna Himalayas. Also visit the ancient hill-fort, known as Kot. Return to Pokhara for staying overnight. Today, you are going to drive back to Kathmandu where after arrival; you are going to complete the check- in at your hotel. Relax for some time and then have your lunch. In the afternoon, leave for sightseeing. First in line will be Bhaktapur, a place housing medieval art and culture also known as Bhadgaon, visit the attractions here. Later have Darshan at the very famous Pashupatinath temple, dedicated to Lord Shiva. The last visit of the day will be and Boudhnath Stupa, one of the biggest in the world. Stay overnight. Day 14 is for visiting the remaining attractions of Kathmandu. You will visit the Kathmandu's Durbar Square, now known as the Hanuman Dhoka - the historic abode of Nepal’s royalty, Taleju Temple open only during the Dasain festival for Hindus, Kal Bhairav temple- a temple dedicated to one of the manifestations of Lord Shiva: Kaal and the temple of Kumari, also known as Kumari Ghar- the mythical abode of Kumari (Vestal Virgin), the living Goddess of Nepalese culture. Next visit of the day will be Swayambhunath Stupa- the oldest Buddhist shrine, around 2000-yr old. Have your lunch. In the afternoon, proceed to the Pasupatinath Temple. Have Darshan. The rest of the day is free. Take a stroll in the market. Stay overnight. Today is the last day of the tour, get transferred to the airport to board a flight to Delhi. On arrival, get refreshed. Have your dinner and get transported to the airport or railway station to catch a flight or train for your onward destination.